The LL3 PC Pump is a non-pulsating progressive cavity pump ideal for pumping the latex backing adhesives in the carpet manufacturing industry as well as a standard thickened liquids and flow mediums with solids content such as pastes and viscous fluids. LL3 aftermarket parts are direct drop-in replacements that work with the *Moyno® L3, *Tarby® TL3 and *Continental® CL3 models and afford optimal performance for your pump for a fraction of the price. 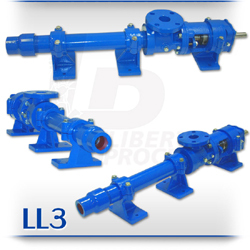 The LL3 is a standard flanged PC pump design with a body made in either cast iron or 316 stainless steel in a modular design containing a simple pinned-joint drive assembly and is designed for either 1, 2, or 3 pumping stages for 75, 150 or 225 psi discharge pressures. Mechanical seal assembly retrofits are readily available and can be selected at the time of your order based upon your application requirements. Standard LL3 PC Pump Rotors are chrome plated hardened tool steel or chrome plated 316 stainless steel. All other internal pump wetted parts are steel or 316 SS and made for durability and use in the harshest manufacturing and pumping environments including high solids content fluids and flow mediums. LL3 Stators come in a wide variety of elastomer materials such as Buna Nitrile, Natural Rubber, EPDM and Viton depending on your applications. The standard seal design option for the LL3 is a set of gland packing with Lantern Ring and flush connections. The LL3 represents one of the most popular choices in progressive cavity pumps available today for the pumping of thickened liquids and liquid adhesives.